Hul’qumi’num delegation to IACHR. Source: HTG Human Rights. 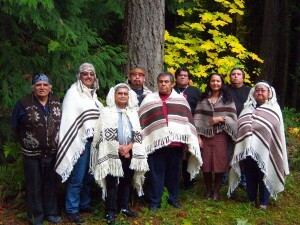 The Hul’qumi’num Treaty Group is a politically-unified group that represents six Hul’qumi’num-speaking First Nations: Cowichan, Stz’uminus, Penelakut, Lyackson, Halalt, and Lake Cowichan. These Nations are all located in and around southeastern Vancouver Island, the Gulf Islands, and the Lower Fraser River. 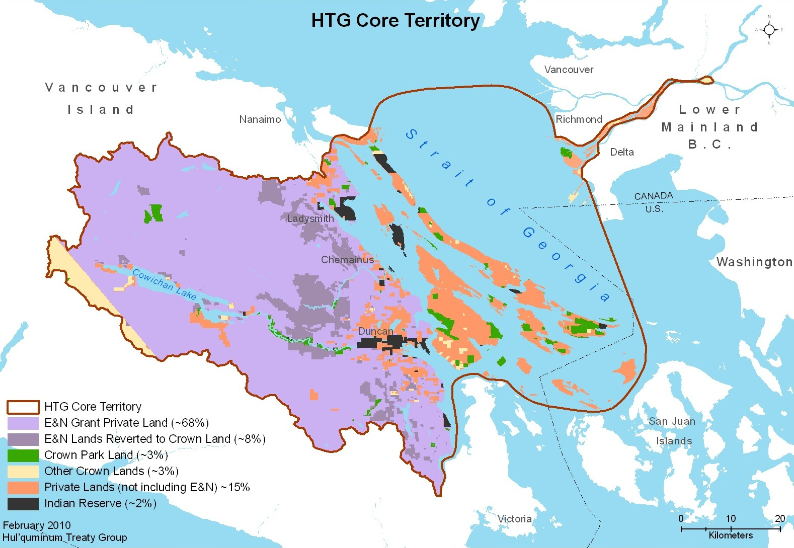 The treaty group was formed in 1993 in order to negotiate a comprehensive land claims agreement with the governments of British Columbia and Canada. 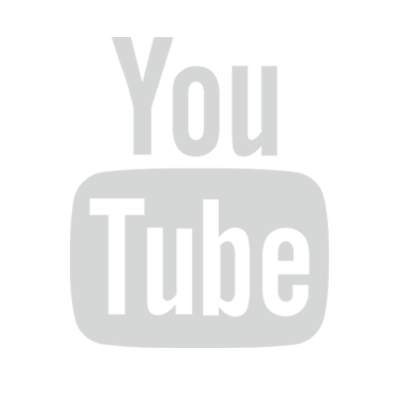 The Hul’qumi’num have been very active in their use of mapping technologies. With the help of Brian Thom, Anthropologist at the University of Victoria and CICADA collaborator, they have created and used their own maps for the celebration and resurgence of their language and Coast Salish culture, which has been very useful for the important task of public education. Furthermore, as Hul’qumi’num land rights have never been ceded, nor recognized by the government, these maps have become central to their work in advocating for their rights and exercising their territorial governance in resistance to the provincial and federal governments. Hul’qumi’num Treaty Group member First Nations. Source: Brian Thom and Kathleen Johnnie, CICADA conference presentation 2015. In the 1870s and 1880s, reserves began to be established in Hul’qumi’num territories. In 1884, Robert Dunsmuir, a private coal-baron, had the entire east coast of Vancouver Island granted to him in private free-hold fee simple title. In exchange for this land title, Dunsmuir arranged to build a railway from Victoria up the east coast of the island, in order to access coal fields for mining activities. This exchange was called the Esquimalt and Nanaimo (E&N) Railway Land Grant, and is locally known by the Hul’qumi’num as the Great Land Grab. Thus, all of the Hul’qumi’num territories, as well as the territories of neighbouring communities, fell into private hands. This set the stage for the Hul’qumi’num Treaty Group’s contemporary struggles. Private land ownership in Hul’qumi’num territories. Source: Brian Thom and Kathleen Johnnie, CICADA conference presentation 2015. 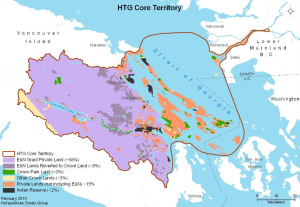 Hul’qumi’num traditional territories form a complex landscape: 85% of the territory is composed of private land, much of which is owned by private industrial logging companies. Meanwhile, less than 2% of these traditional lands have been allocated to Hul’qumi’num reserves. Many of the political struggles in which the Hul’qumi’num are engaged are due to the challenging nature of this landscape. At the 2015 CICADA conference, Kathleen Johnnie, previous Lands and Resources Coordinator of the Lyackson First Nation and CICADA indigenous partner, listed three of the Hul’qumi’num’s primary political struggles and activities: Grace Islet, Kinder Morgan, and land use planning and mapping. Grace Islet ancestral site. Source: Brian Thom and Kathleen Johnnie, CICADA conference presentation 2015. Grace Islet is a small privately-owned island located in Fulford Harbour (Saltspring Island). It is an extremely sacred burial site for the Lyackson First Nation, housing many burial cairns. In 2011, a private land owner began constructing a house on Grace Islet that incorporated the burial cairns into the house’s foundation. This was considered an extreme offense against Coast Salish people and their culture and laws. 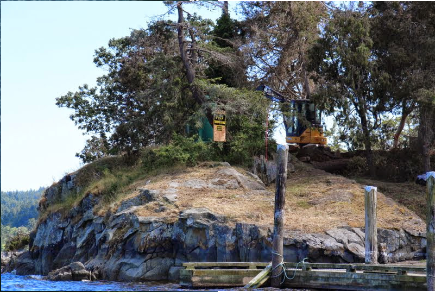 For years, a number of First Nations collaboratively fought the construction of the house, and finally in 2015, British Columbia repurchased the islet from the private land owner to ensure the protection of the burial site. Currently, members of the Hul’qumi’num Treaty Group are involved in the process of deconstructing the house’s foundation in a careful and controlled manner. Proposed route of the Kinder Morgan pipeline. 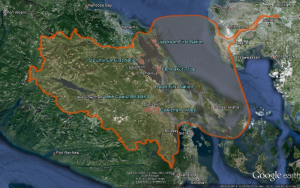 Source: https://www.wildernesscommittee.org/sites/all/files/images/KMpipeline_Tanker_Route_Salish_Sea_Map.jpg. 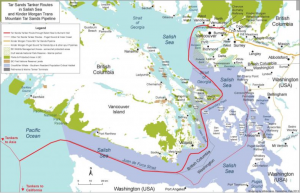 Kinder Morgan has proposed a pipeline to bring diluted bitumen from the Alberta tar sands to the coast of British Columbia. 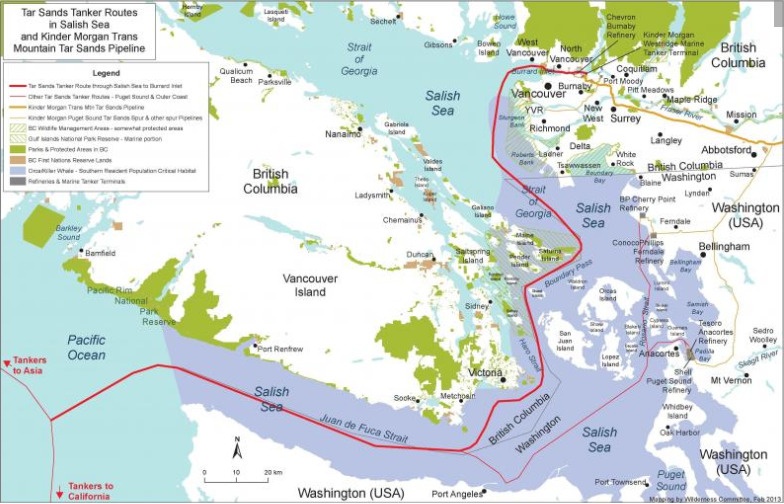 The bitumen would then be shipped by marine tanker traffic to the Salish Sea, passing by Valdes Island, part of which is inhabited by the Lyackson First Nation. The Lyackson have identified two primary issues associated with this proposed pipeline. First, the marine tanker traffic produces low frequency sound that can be felt and heard in Valdes Island, as the island is made of sandstone. Second, there is the potential that a spill could occur in the sea, which would deeply affect Lyackson fisheries, shorelines, and access to sacred sites. In response to this proposal, the Lyackson First Nation has intervened in the National Energy Board Hearing Review to express their concerns. 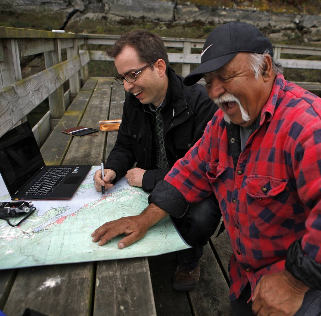 Stz’uminus First Nation elder Ray Harris (right) and CICADA collaborator Brian Thom (left). Source: http://www.theglobeandmail.com/news/british-columbia/oral-history-goes-digital-as-google-helps-map-ancestral-lands/article19566302/. The Hul’qumi’num Treaty Group have been producing maps to ensure that they expressing their interests on the land and in the water, in an effort to be heard by the Crown during their land claims process. Through these maps, they have been identifying particular areas of importance, with the purpose of informing land use planning and policy. The Hul’qumi’num have specified that mapping in and of itself does not show the entire depth of Hul’qumi’num territorial interest or land use, as many of the ways in which the land is used are not necessarily tangible. Nonetheless, Kathleen Johnnie of the Lyackson First Nation remarks: “But we recognize also the usefulness of having this mapped out, having these layers available to us, to our staff. Because if we don’t have this then Grace Islet will happen again, then Kinder Morgan will get to do whatever they want with impunity. And so today we are taking up our governing authorities and choosing how we will govern our lands and our waters for our own protection and use.” As such, the Hul’qumi’num Treaty Group, in collaboration with Brian Thom, has continued to pursue mapping projects in an effort to represent their territories, as well as the places of importance and the activities that occur on those territories.